Across South Australia we maintain and operate nine desalination plants. There are two seawater desalination plants we own: one at Lonsdale in Adelaide and the other at Penneshaw on Kangaroo Island. The other six desalination plants treat groundwater. We own plants at Hawker and Leigh Creek, and operate plants at Indulkana, Mimili, Kaltjiti (Fregon) and Yunyarinyi (Kenmore Park) on the Anangu Pitjantjatjara Yankunytjatjara (APY) Lands in the far north of South Australia, and Yalata on the west coast on behalf of the landholders. Desalinated water has the salt and impurities removed. The water source is not always the sea, for example at Hawker, Leigh Creek, the APY Lands and Yalata, the desalination plants treat bore water. Our desalination plants help ensure we can continue to provide safe, clean drinking water for our customers. Using desalination technology enables the supply of safe, clean drinking water that is climate independent, including in times of low rainfall and drought. Our desalination plants use a technology called reverse osmosis which removes up to 99 per cent of the impurities and salt in the water. Once the impurities (mainly salt) are removed, the water is treated to meet health standards ensuring it is safe and ready to drink. The drinking water we supply is treated to meet the Australian Drinking Water Guidelines (2011). 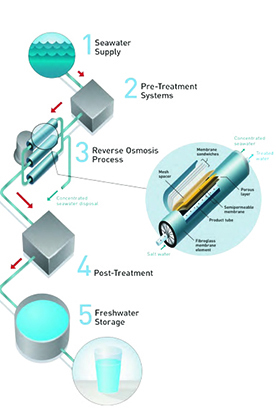 The diagram below briefly explains the process of reverse osmosis. The Adelaide Desalination Plant (ADP) at Lonsdale is our largest desalination plant. It is Adelaide’s only climate-independent source of drinking water. The plant has been delivering drinking water since 2011. In full operation, the plant can produce 100 gigalitres (GL) a year. This is about half of Adelaide's annual water needs. The plant's water production capacity is extremely flexible, ranging from as low as 10 per cent (30 megalitres [ML] a day) to as high as 100 per cent (300 ML a day), and can be adjusted in 10 per cent increments. This flexibility means we can align production to rainfall and efficiently meet our customers’ supply requirements, including supply high quality drinking water in times of low rainfall and drought as well as emergency needs. The ADP has been producing safe, clean drinking water since it began operating in July 2011. 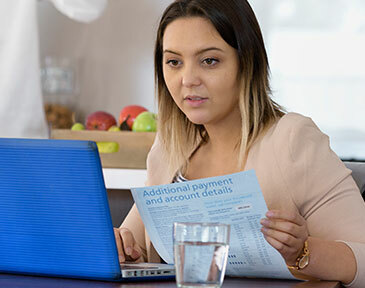 When other water sources are plentiful, we maximise the service life and value of the ADP and minimise electricity costs, by switching to a minimum production mode. This can be for around nine months of the year, contributing up to 8 GL of drinking water annually of about 200 GL supplied to Adelaide. For the remaining three months of the year, when demand is typically low during wetter periods, it operates in standby mode. During this time, we undertake maintenance while no water is being produced. Desalinated water from the ADP is pumped along an 11 kilometre transfer pipeline to storage tanks at the Happy Valley Water Treatment Plant, where it’s blended with treated water from the reservoir. This water is then supplied to about 450,000 homes and businesses from Port Adelaide in the north-west to Noarlunga in the south, Blackwood in the foothills and Adelaide’s CBD. We regularly host tours of the ADP where visitors can see the site by bus and go inside a viewing area of one of the main process buildings. Tours run for around one and half hours and bookings are essential. Find out Find out more and book your tour. monitoring the environmental health of Gulf St Vincent. Since 2008, before the plant was built we started monitoring to set a benchmark against which to measure conditions in the Gulf. Independent reviews of the ADP’s environmental performance on EPA licencing monitoring requirements show the plant has caused no harm to the environment. Along with government and community groups, we also help protect the Gulf St Vincent. The ADP produces saline concentrate as one of the by-products of the desalination process. This concentrate is put back into the ocean using a series of special diffusers. The diffusers sit about one kilometre off-shore and are designed to rapidly mix the concentrate with sea water to dilute it. The other important role of the diffusers is to keep the salinity levels consistent in the Gulf St Vincent. We constantly monitor the marine environment in the Gulf using real-time data on water temperature, salinity and the speed of the currents. We are committed to making sure the plant has minimal impact on the marine environment. The intake system used on the desalination plant was designed to minimise the risk of any marine life getting caught in the water intake. This is achieved by drawing the water in slowly. Offshore monitoring, since the plant began operating., finds consistent salinity levels around the outfall. Using baited remote underwater video cameras, we have observed a wide variety of fish and other marine animals living on the artificial reef surrounding the outfall. It’s important to note this area is also part of a marine exclusion zone, so there’s no fishing allowed, and permanent security cameras monitor the site day and night. This video taken in 2018 shows the fish and marine life that have made the area around the diffusers home. The design of the plant's out-fall system beneath the cliffs and under the sea bed, reduces its impact on the nearby coastal reefs. A small seawater desalination plant was constructed at Penneshaw on Kangaroo Island in 1999. Seawater is drawn into the plant through an intake pipe and pre-screened. UV disinfection is used to minimise biological growth and filters remove most particulate matter. The filtered seawater is forced under high pressure through reverse osmosis membranes that allow fresh water to pass through, with very little salt. The desalinated water is re-mineralised with carbon dioxide (CO2) and marble chips before it is disinfected with chlorine and supplied to customers. The plant can produce 400 kL of drinking water per day. Water for the Hawker township comes from a local groundwater basin. The groundwater is very hard and it is high in total dissolved solids, which makes the water very salty. While this water meets the Australian Drinking Water Guidelines (2011) health criteria it tastes salty. Working together with the Flinders Ranges Council we found a solution that would work in a remote location and now we improve the taste of the water at the Hawker Desalination Plant. The plant began operating in August 2014 and can produce 500 kL of drinking water per day. The management of water services in Leigh Creek shifted from Flinders Power to us, in December 2016. Leigh Creek draws drinking water from a number of local bores and due to the relatively high salinity of the ground water supply, a small desalination plant is used to treat the water. The plant can produce up to1.25 ML of drinking water a day. Being able to successfully operate desalination plants is especially useful in remote locations such as the Anangu Pitjantjatjara Yankunytjatjara (APY) Lands, to help ensure reliability and sustainability of the drinking water supply for everyone living in these communities. We operate desalination plants at Indulkana, Mimili, Kaltjiti (Fregon) and Yunyarinyi (Kenmore Park) in the far north of South Australia, and Yalata on the west coast. These plants treat water from local bores to ensure it meets the Australian Drinking Water Guidelines (2011). Current plant was commissioned in 2006. We installed a 40 kW solar system with battery storage in 2016. Total capacity of 160 kL/day. 14 kW solar installed September 2018, with plant timed to run during daylight hours only. Total capacity of 40 kL/day. Total capacity of 60 kL/day. 10 kW solar with battery storage installed in 2016. Total capacity of 20 kL/day. Under construction, due to be commissioned in June 2019. Will have a total capacity of 60 kL/day. We are committed to providing our customers with safe, clean drinking water. A dependable supply requires a reliable source. The majority of water on the Eyre Peninsula is sourced from groundwater which is drawn from the Uley South Basin with about 20 per cent coming from the River Murray via the Morgan to Whyalla pipeline. Together with the Department for Environment and Water we are measuring and monitoring critical indicators that assess the health of groundwater resources including the Uley South Basin. Read more about long term planning and proposed desalination for the Eyre Peninsula.